Have you ever wondered why some women have the most beautiful looking natural eyelashes? Is it genetics? luck? mascara? Latisse ?or are they Eyelash extensions? The eyes are a focal point of the face. Some say that our eyes are the windows to our souls. Studies show that long eyelashes and large eyes are considered a sign of youth and beauty. Fuller and longer lashes will emphasize and frame your eyes, giving you a more refreshed, awake appearance. I have been wearing eyelash extensions for several years now. Needless, to say I am a fan. For myself, they are a time saver and I love the look….no other make-up is necessary on the eyes. Most days all I wear is a tinted sunscreen and some lipstick or gloss! Over the years I have tried different people and places for my lashes, for the last few years, I have been going to Eileen Sculnick in Ottawa. Eileen has been working with cosmetics and esthetics her entire career and eyelash extensions were a natural extension (intended pun) for her business and her clientele. The F-word Paradox will be starting a new blog feature entitled Five Questions. We will feature fabulous people with what I am sure will be fascinating and interesting information about their area of expertise. Eileen Sculnick of Nails by Eileen has graciously agreed to be our first guest. I recently asked Eileen Five Questions on Eyelash Extensions. 1-Who are the right candidates for eye lash extensions? Anyone who has lashes and wants to enhance them. But you must have some lashes that are long enough and strong enough to withstand a lash being glued to it and not damaging it. Unfortunately anyone who has lost there lashes and nothing has grown back cannot have lash extensions. 2-What are the benefits of having eyelash extensions? 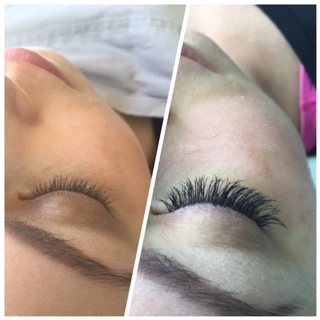 The main benefit to have eyelash extensions is that you no longer need to wear mascara. You no longer have to worry about black circles under your eyes because your mascara has smudged and of course there is nothing to remove before going to bed. Most women find that they need to wear less eye makeup and they still feel very put together. 3- Are there any disadvantages to having eyelash extensions? There really aren’t any disadvantages to having eyelash extensions, but of course there is maintenance necessary once you have your initial application. Refills are necessary between 2-4 weeks and can cost $50-$100 depending on who you go to and if they charge based on time or just a set price. Other than cost and maintenance it’s really important that the health of the lashes are never compromised. Everyone wants the thickest, longest lashes and that’s ok if your lashes can handle that. Ultimately it is recommended to take a break every 6-8months and let the lashes regenerate for about 6-8 weeks. 4- With lots of different options now on the market for eyelash extensions how should client chose where to go and what questions should they ask? if a salon is not clean and welcoming. Especially with eyelash extensions, because it is a very delicate service. It can also be nerve wracking the first few times because your eyes are taped shut and this can cause anxiety. What products the technician uses is very important as well because not all products are created equal. A calm, tranquil atmosphere is so nice so that the client can relax and the technician can easily work on this very delicate and sensitive area. 5-Final thoughts and tips for eyelash extensions? Eyelash extensions are a wonderful way to enhance your eyes with very little necessary upkeep. A cleanser and protector(the protector seals the lashes and extends the life of the extensions) are really the only two products you need. Cleaning the lashes nightly even if you don’t wear any other make-up is very important as well. It’s a bit of a learning curve initially but ultimately becomes second nature. Woman’s lives are generally so busy that having one less thing to do is such a treat! !